Keli Knight, Yondi Morris, and Jessica Reddick are proof that you should never underestimate the power of social media. After sending out one simple tweet about the frustration she was facing at her current law firm, Morris connected with Knight on the idea of starting their own firm. Shortly thereafter, the two young lawyers sat down with their mutual friend Reddick to further discuss the idea, and a year later in 2012, KMR Law Group was launched. Now, with nearly four years under their belt as the leaders of their own firm, Knight, Morris and Reddick have expanded their practice to include commercial and residential real estate transactions, corporate law, entertainment law and mediation. 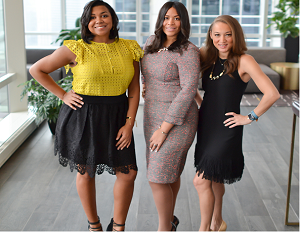 With locations in Chicago, Los Angeles and soon-to-be D.C., it’s clear that these three lawyers have long-term plans for changing the landscape of the industry. BlackEnterprise.com: Did you guys know each other prior to Yondi sending out her tweet? Knight: Yondi and I knew each other prior to forming KMR and prior to that tweet through one of Yondi’s childhood friends and one of my friends. Yondi and Jessica have known each other since college. Yondi attended Spelman, and Jessica attended Spelman for a year in their foreign exchange program. What was the planning process like before you actually launched KMR? Reddick: We planned for a whole year from the day that we sat down at Starbucks until the day that we opened our law firm in September 2012. We were all in different positions and places before we came together for KMR. Yondi worked as a contract worker. I was working for a non-profit as an in-house counsel, and then working in real estate with the city of Chicago on the foreclosure crisis here. I was really happy with my work and wasn’t ready to fully leave, so I actually worked that job through the first two years of KMR and didn’t leave there until December 2014. In that year, we met with as many professionals as we could, including our mentors, practitioners and other men and women who had started their own law firms successfully.We met with financial advisors, branding people, and website people. It was really important for us to figure out who we were in the industry because as young black women in an industry filled with older white men, particularly on the ownership side of the law firms, we wanted to make sure we could compete with our counterparts and be taken seriously. How did you finance KMR? Morris: When we were in our year planning stage, we each had to put $20 a month into our joint account. So you can imagine at $60 a month we didn’t have much when it was time to actually jump into things. But because we had been meeting with people for so long we figured out how to be cost-effective in our approach. There was also one person who was really inspired by what we were doing and they gave us a donation. What advice do you have for law school graduates who are having a hard time in today’s job market? Reddick: I think work experience and mentorship is really important when it comes to being a lawyer because law school does not teach you how to be a lawyer. It teaches you how to critically think like a lawyer, but it does not teach you how to practice. I had a great mentor at my last job who had been in the real estate legal industry for years and I learned so much in the six years I worked for her. I also encourage people to think outside the box in how you can apply your law degree, because you can work for a government agency, as a lobbyist, etc. Morris: I think that particularly for African Americans, we don’t necessarily learn early on or have the resources to network with certain types of professionals while growing up. So I think it’s important for law students to make sure they are networking as hard as they can while they are in law school, because it can be really helpful in figuring out what they are going to do afterwards in terms of job placement.